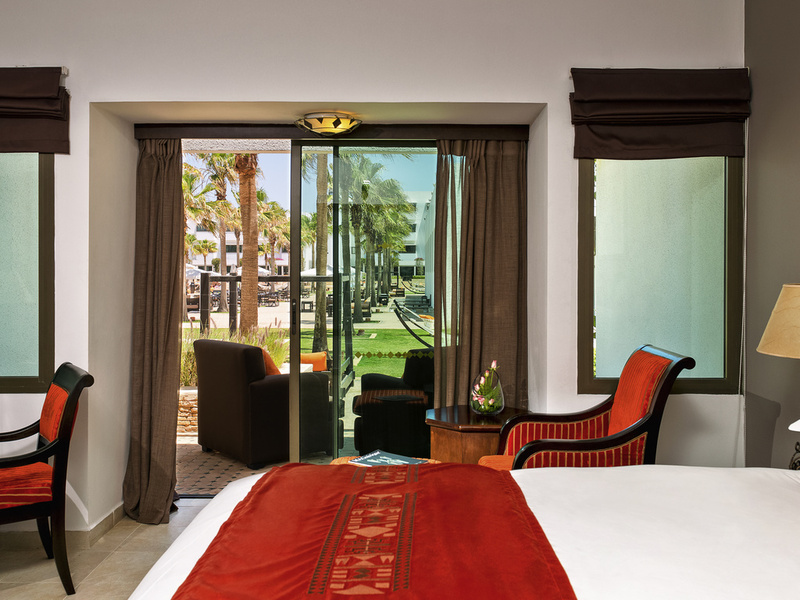 Kasbah inspired by Arab-Berber art and nestling in a bay of palm trees which plunge into the ocean, the Sofitel Agadir Royal Bay Resort offers a Berber welcome and Moroccan flavors for an authentic experience. Enter into the world of the Souss Massa with a warm decor featuring copper and wood, where the iconic fiery orange color mingles with the sound of birdsong and tinkling fountains. Family gatherings, romantic breaks or business seminars? Enjoy a wealth of services, individually tailored to your needs and desires. Enjoy a change of scenery with a camel ride and lose yourself in the Amazigh back country, feel the rhythm of our oriental evenings and relax with a traditional argan oil massage overlooking the ocean. Welcome to the kingdom of celebration and relaxation, where business trips and leisure stays, be they long or short, benefit from a wealth of experience, adapted to suit everyone's pace and needs. Life is Magnifique in Agadir..
Push open the solid carved wooden doors and get ready for a unique and authentic experience. Live the life of a star when you stay at Villa Royale, with a private airport transfer, a reception by your own personal butler, a whirlpool bath overlooking the sea and an intimate dinner by the poolside, all ensuring absolute relaxation. 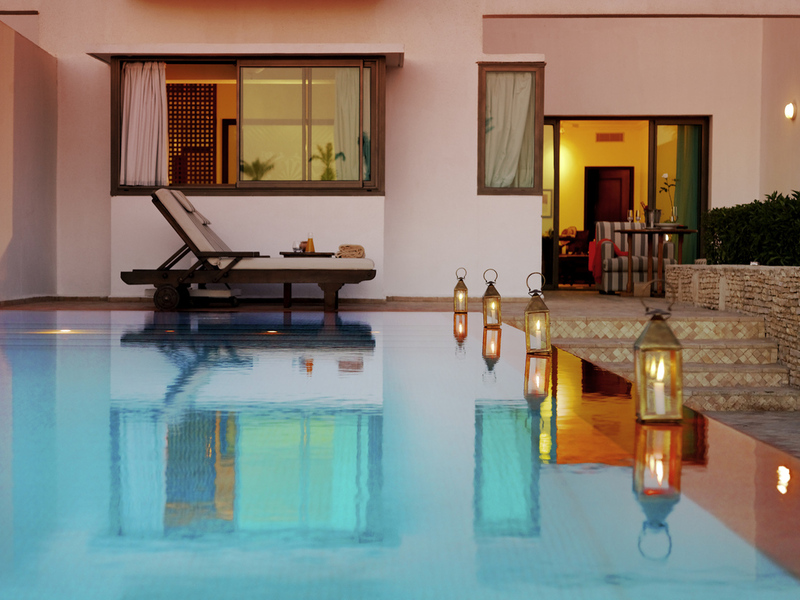 In the heart of the Maison, once night has fallen, Le Riad is revealed in all its glory. With hundreds of candles flickering under a starry sky, enjoy a unique evening to the backdrop of an acoustic concert. The best place for Agadir nightlife, the So Night Lounge is where all the international artists go. Enjoy the buzzing atmosphere of this club which opens its doors to you for an unforgettable night that will go on into the small hours of the morning. 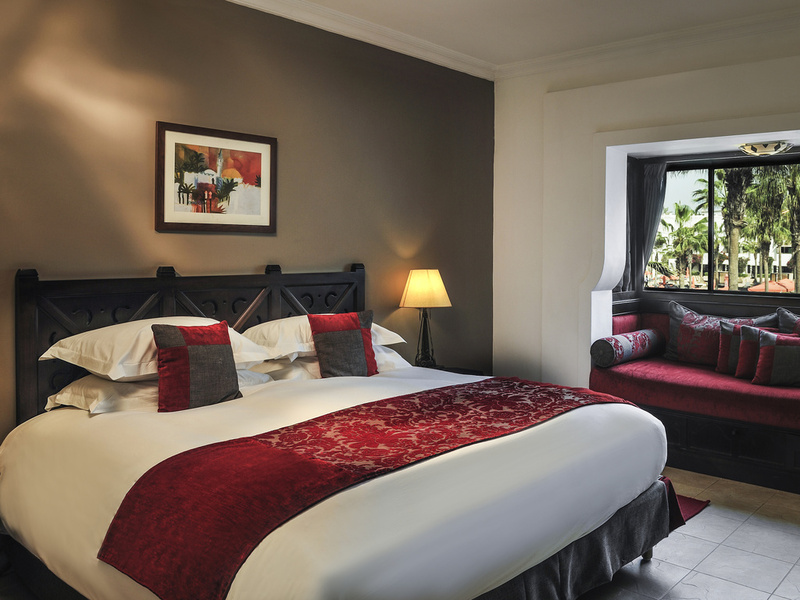 Soak up year-round sun in the seaside town of Agadir in southwest Morocco; the resort is right on the beach, a pleasant stroll from the corniche, marina, and Agadir's bustling souk and cafés. A fabulous 5-star hotel in Morocco's "pearl of the south".Agadi r's Al Massira international airport is a 20-minute drive from the hotel. Arrange a pick-up or follow signs for Agadir Centre-Ville (center) and Founty. The hotel is set right on the beach, overlooking the Atlantic ocean. 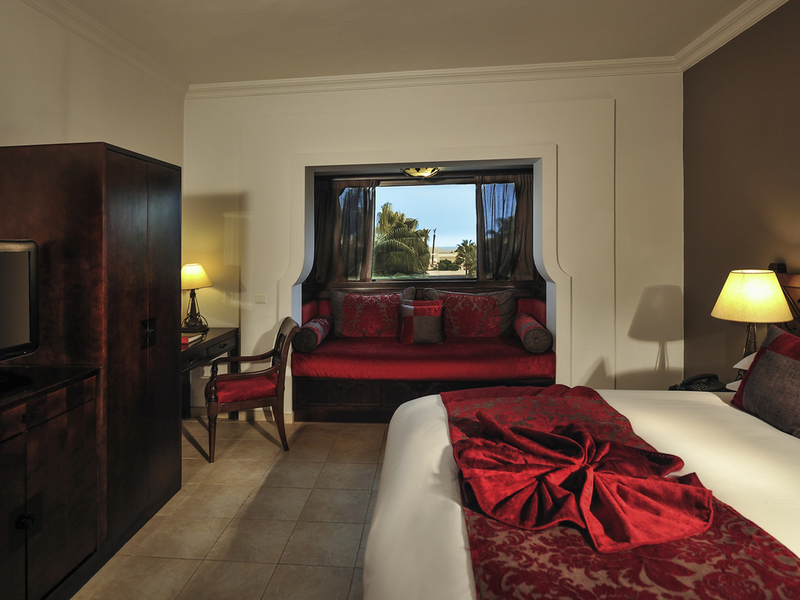 Warm colors, Berber-inspired motifs and carved lamps combine to create the Moorish ambiance of our 273 rooms, Suites & Villas. 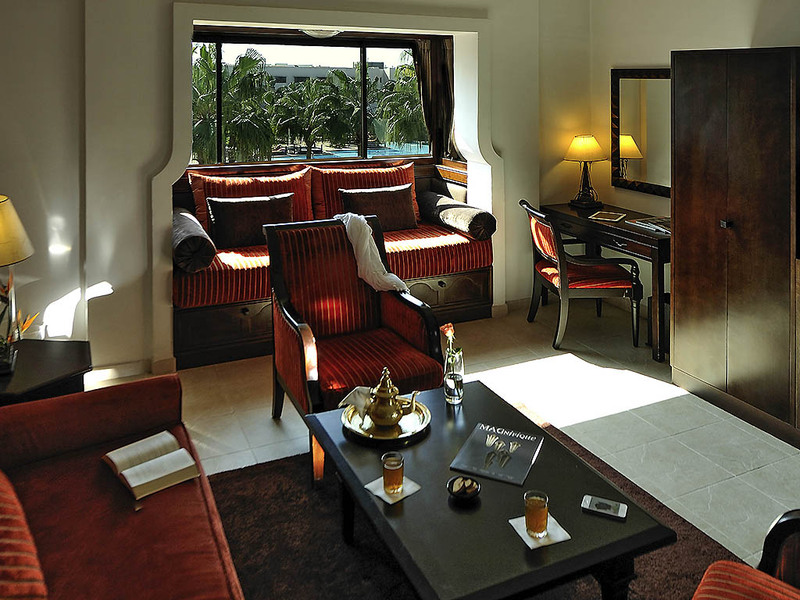 Made of exotic wood, the furnishings of each accommodation pay tribute to traditional Moroccan craftsmanship. 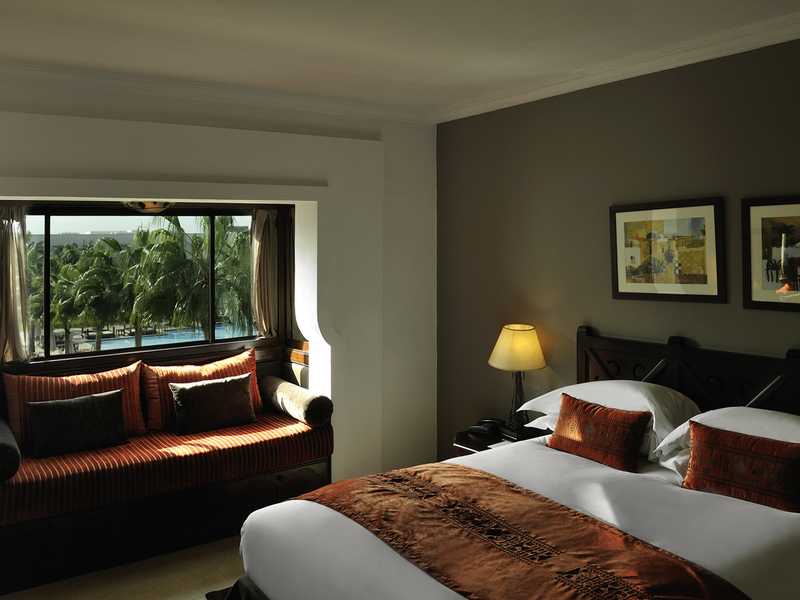 Rooms provide a peaceful and serene atmosphere to recharge after a day full of discovery. Our MyBed bedding offers an unparalleled experience ensuring a restorative night's sleep. A family trip? 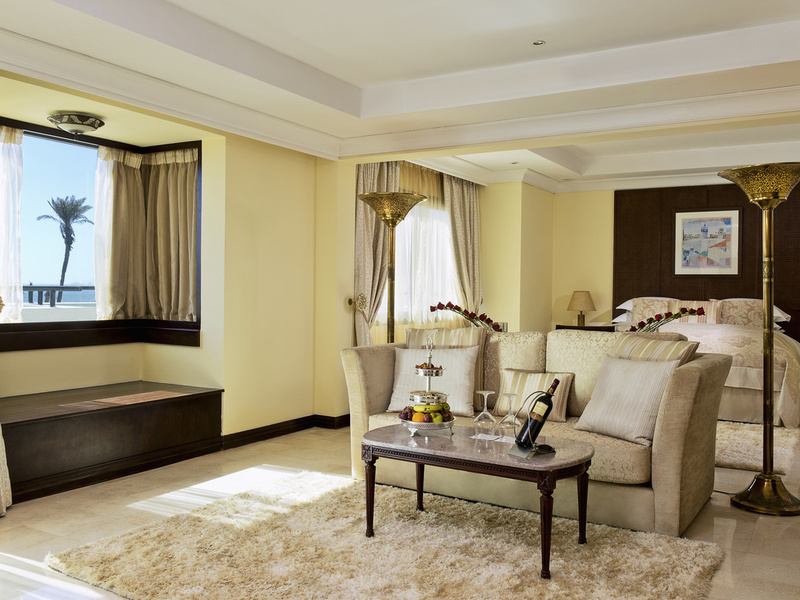 Choose one of our 18 Prestige Suites and give everyone the space and comfort they need. Looking for privacy? Treat yourself to a stay in one of our villas with its own private pool, views over the Atlantic and a dedicated butler service. 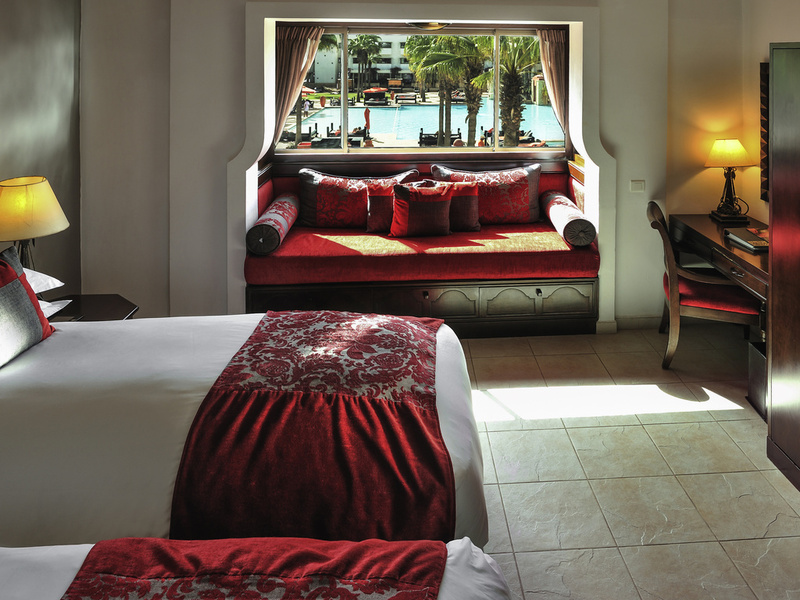 CLASSIC ROOM, 1 King Size Bed, Garden View. 322 sq. ft. (30m²), decor inspired by traditional Moroccan designs. Sofitel MyBed bedding and convertible sofa bed for children under 12, free WIFI, welcome products, safe, air conditioning, bathroom with bathtub, bottle of water upon check-in. SUPERIOR ROOM, 1 King Size Bed, garden view. 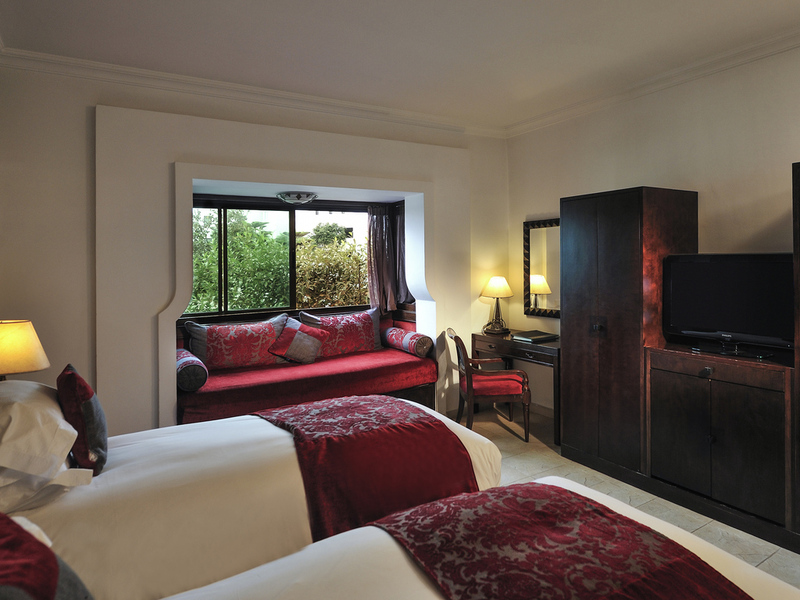 SUPERIOR ROOM, 2 Single Size Beds, Garden View. 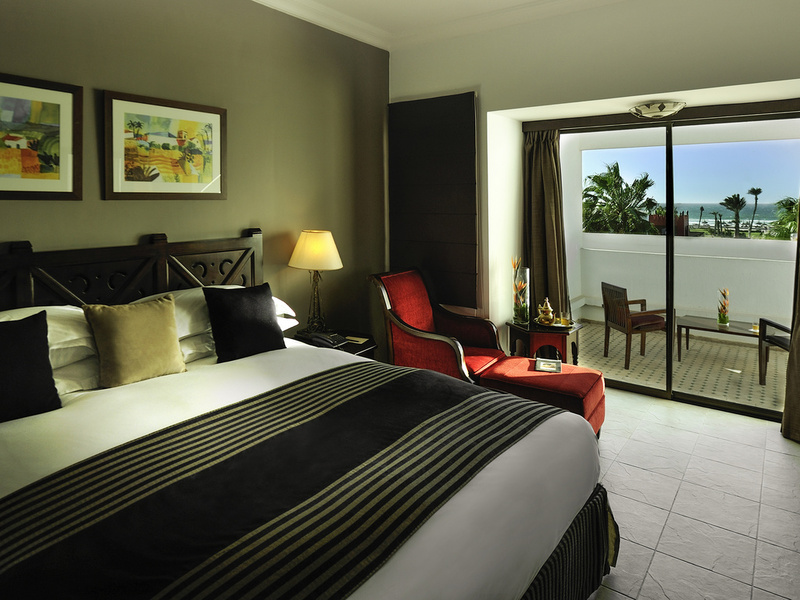 LUXURY ROOM, 1 King Size Bed, Ocean View. 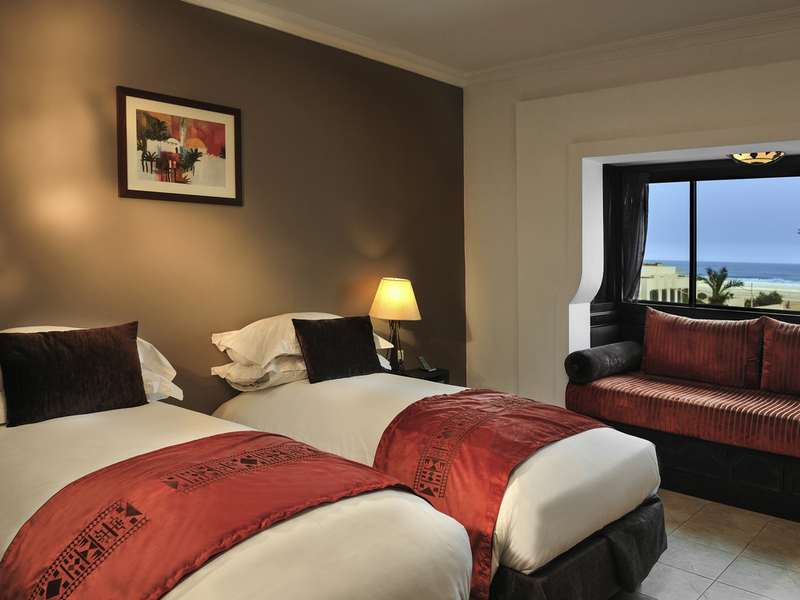 LUXURY ROOM, 2 Single Size Beds, Ocean View. 646 sq. ft. (60 m²), offers complete comfort with traditional décor. Sofitel MyBed bedding, lounge can be converted into children's room, 2 bathrooms for greater privacy, free WIFI, Lanvin welcome products, Nespresso machine. Sofitel Agadir Royal Bay invites you for a truly tantalizing experience in one of its 4 restaurants, each with its own unique ambiance. Enjoy a different tasting experience every day and be blown away by the creativity of our chefs! Providing you with places to meet and catch up, our bars combine originality and a friendly atmosphere to suit your needs, any time of day. Laze back on the sofas of this trendy yet relaxed Agadir bar and chat with friends over a cocktail or plate of tapas. A perfect place to end the perfect day - and to start the evening with a pre-dinner drink and soft lounge music. With live bands and DJs every night except Sunday, Le So Night Lounge is Agadir nightlife at its best. Start with a cocktail in chic So Nice, fuel up on French cuisine in So Good, dance all night in So Fun. If you need a break, So Zen's cozy benches call. Under a starry sky, wander a well-lit alley toward a Berber tent overlooking the sea; whether it's a theme, color or even a particular ambiance, share your dream evening with our teams and we will turn it into a reality. The Spa invites you to discover the beauty secrets of the East. A true oasis of relaxation as per Moroccan tradition, the Spa offers an intimate setting where Eastern charm and the art of wellness combine for a journey of the senses into the Berber land. Welcome to the kingdom of celebration and relaxation, where business trips and leisure stays, be they long or short, benefit from a wealth of experience, adapted to suit everyone's pace and needs. 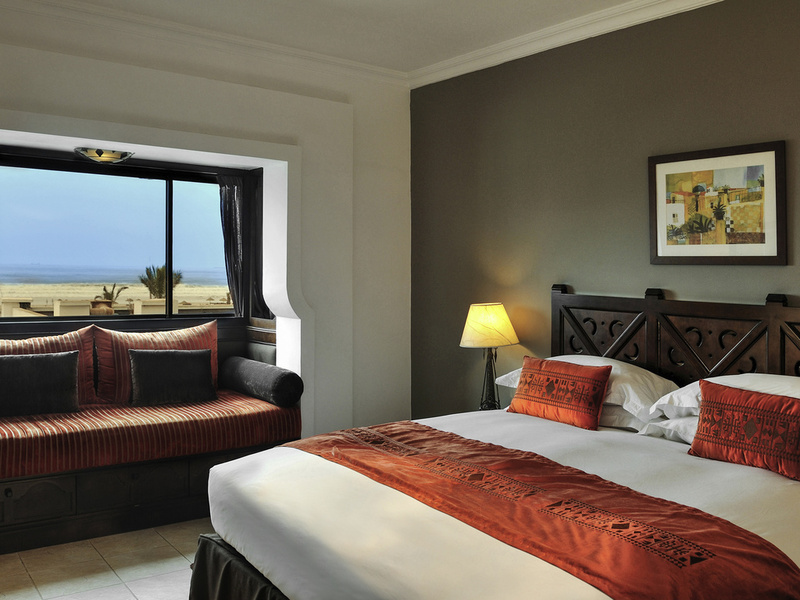 A welcoming, family-friendly hotel: cookery, jewelry design, football, and children's cinema as well as water sports, golf, excursions in the desert or the Atlas mountains for adults. Tennis courts, volleyball courts and thalassotherapy center nearby. There are hidden treasures in the Amazigh countryside. Meet artisans who work with silver and the legendary Argan oil using techniques passed down through generations. Lose yourself in Paradise Valley among waterfalls and fields of almond trees in bloom. The fitness center at Sofitel Agadir Royal Bay Resort is open every day to help you keep in shape using cutting-edge fitness equipment.